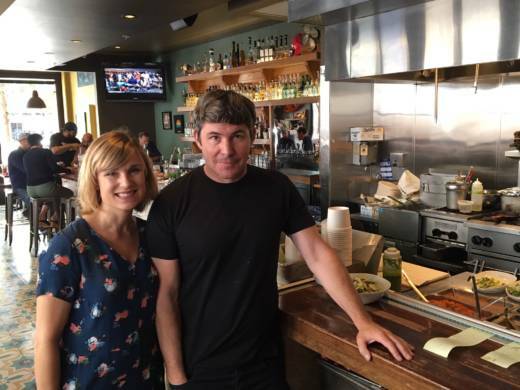 Joe Hargrave, co-owner of San Francisco's Tacolicious restaurants, says customers who come in and sit down for lunch have no idea that all the hustle and bustle in the kitchen has very little to do with serving them. At the bar near the kitchen, an employee rushes around to handle all the incoming food orders from a third-party delivery app called Caviar. Even before the restaurant opens, online orders often pile up from Caviar, Uber Eats and DoorDash. Hargrave says the apps account for more and more of the restaurant’s lunch business. While lunch sales for Tacolicious are down 35 percent, lunch revenue is up 8 percent. Co-owner Sara Deseran says third-party delivery apps have changed how the two run the place. "As long as we will be delivering food, which I don’t see that ever ending,” Deseran says, “then we have to adapt every single thing we do." For instance, the delivery app Caviar says its customers wanted food in bowls. Now Tacolicious is serving food in bowls. The restaurant had stacks of plates on the bar. Now they’ve replaced half of the plates with stacks of to-go boxes. Tacolicious is even making changes to their staff to accommodate the apps. As we sat in the restaurant talking, Hargrave received an email. Tacolicious already has a person to manage customer phone calls, many of which happen to be about issues with deliveries. You might have seen someone working one of these third-party delivery app jobs at other restaurants. They’re usually behind the bar, surrounded by tablets. The tablets are running all the different delivery apps. You also might have seen the delivery workers for the apps. They are often on mopeds, and still wearing their helmets when they come into the restaurant. 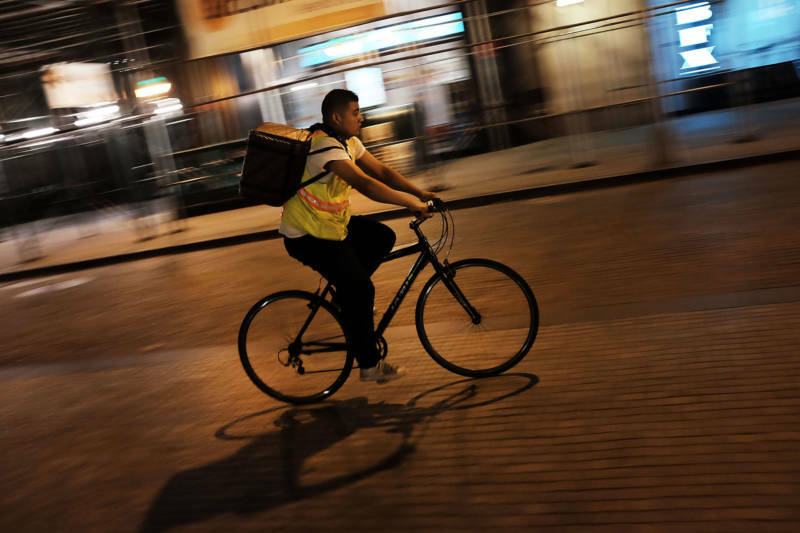 These workers are paid by the order, which means they’re rushing into the restaurant to grab food and make their deliveries as quickly as possible. Deseran says the apps create all kinds of chaos that restaurants have to manage. “Who is going to be dealing with these orders?” Deseran asks. “Will we have another person taking these orders? Will it be its own position? Where will we store the compostable trays? It’s almost like you are running an entirely different business on top of your business,” Deseran says. When something goes wrong with a delivery, the restaurant often has to deal with it. The restaurant gets the angry customer phone calls and the bad Yelp reviews. Venture capitalists have poured billions of dollars into these third-party apps. Over the last few years, the apps have been vying for market share and trying to get people used to ordering food online. The companies make revenue by taking a cut of the orders. Some of the companies siphon off as much as 30 percent from each delivery total. Profit margins in restaurants are notoriously small. So even though restaurants might get more business through the apps, they may actually be losing money on each order. Hargrave believes all this could get worse as the companies transition from using venture capital to build market share to trying to make real profits. "What’s going to happen to the rates when they start killing each other and one reigns supreme and they have to make a profit?” Hargrave asks. At that point, he says, diners may be so accustomed to the apps that restaurants have to serve them. The National Restaurant Association is steering its members toward embracing the apps as a way to reach customers and sell more food. It sees this as the future that restaurants must conform to in order to survive. Hargrave and Deseran own five restaurants, which has allowed them to adapt to the apps. For instance, they can negotiate lower rates to be taken from each order and hire people to manage all the third-party apps. Smaller mom-and-pop restaurants don’t have these luxuries. So many don’t use the apps, which means that as more and more people order delivery, they could lose out. At Tacolicious, Hargrave’s big worry is that he’ll have to compromise on his food to feed the delivery apps, like adding preservatives to his tortillas. Deseran says they’ve already taste-tested their food after it’s been driven around for 20 minutes in a car. So, like, food marinated in a Uber? "Yes," Deseran says, "pine scent and all." Jokes aside, Deseran says she wishes they didn't have to do delivery at all because of how it affects their food. GrubHub and Uber Eats are also testing ways to make food stay fresher during transit. But Hargrave says that when it comes down to it, what he really loves is having people actually come into the restaurant. Eating at a restaurant, Hargrave believes, is one of the last bastions of human connection that isn’t mediated through an app. And he would prefer to keep it that way.